As teachers we are constantly under the microscope. We have our students, their parents, our administrators, and more looking to us to carry out our responsibilities. Don't get me wrong, as teacher's we bear an amazing amount of responsibility which should not be taken lightly, but sometimes these responsibilities become a little crushing and we need a confidence boost. 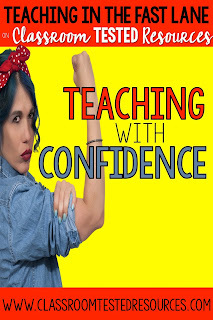 By teaching with confidence we show our professionalism, and encourage our students to be confident as well. Confidence does not just appear though, we have to work at it. While confidence is built on a series of successes there are certain elements that are more in our control. 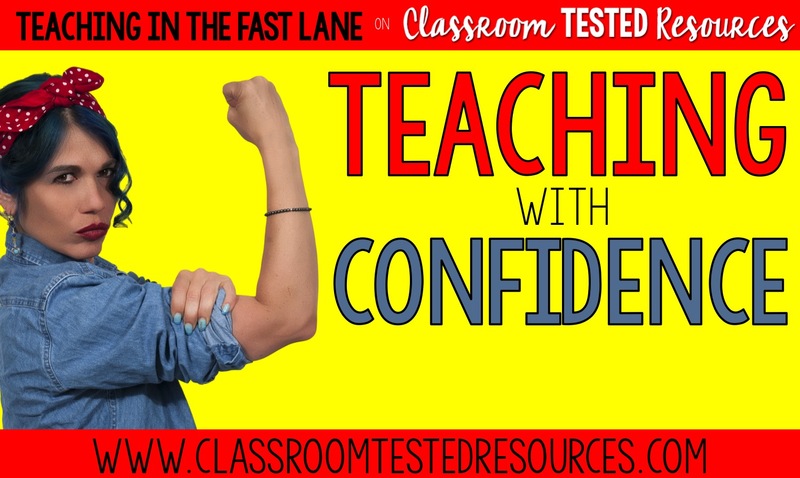 The number one thing you can do in the classroom to be more confident is to be prepared. When you are unprepared you are likely to be nervous and that feeling will come across in everything you do. While you cannot predict every situation that will arise in the classroom you can think through situations that are likely to happen at some point and make a plan for them. For example, why wait until the first time you have a fire drill to practice the procedure. Instead go over your desired procedure with your students from the beginning of the school year. This way, by the time the first fire drill occurred you and your students will be cool as a cucumber instead of running around like chickens with their heads cut off. This principle crosses over into every part of your classroom. By always being as prepared as possible when it comes to having your copies made, planning for a sub, or having procedures in place you can have the utmost confidence in your classroom. While planning ahead is great, and necessary, you cannot possibly plan for every little thing. This is where your teacher community comes into play. By surrounding yourself with other confident teachers you will always have a plan b ( and c,d,e...) waiting. Teachers accomplish amazing things when they work together. For example, one time I was at my wit's end with a student that really knew how to push my buttons. I had already tried everything I knew, and was beginning to feel that I was going to lose my cool. At lunch that day I mentioned the student to a colleague who immediately fired off three tips to try that I never would have thought of. By building up your community with other confident colleagues you also add to your teacher tool belt. I know that you have heard before that a positive attitude goes a long way in teaching, and it couldn't be more true. By practicing positivity you are automatically more prepared to take on situations that may arise. This positive outlook can also lead you to be more calm when making decisions that will often continue to affect your classroom long after. So much of teaching is pretending that you know what you are doing. I mean this in the best way possible, because of course you know what you are doing, but teachers as a whole have a major case of imposter syndrome, and we need to just stop. I still vividly remember walking around my classroom my first day of my first year teaching watching my students participate in a cooperative learning activity and thinking to myself, "Wow, there should really be an adult in here with all these kids." Honestly, that's what I thought, because seriously who leaves 22 nine and ten year olds with a twenty-two year old in charge? Teaching is the only career that requires the same of a first year teacher than as a veteran, and while we are capable of meeting these expectations, sometimes imposter syndrome tells us otherwise. It is important to practice positive self talk and just do it, because we can. Soon enough that faking you feel like you are doing turns into confidence, which is what it is all about. For more information on being a happier teacher check out this article on 11 Things Happy Teachers Don't Do.